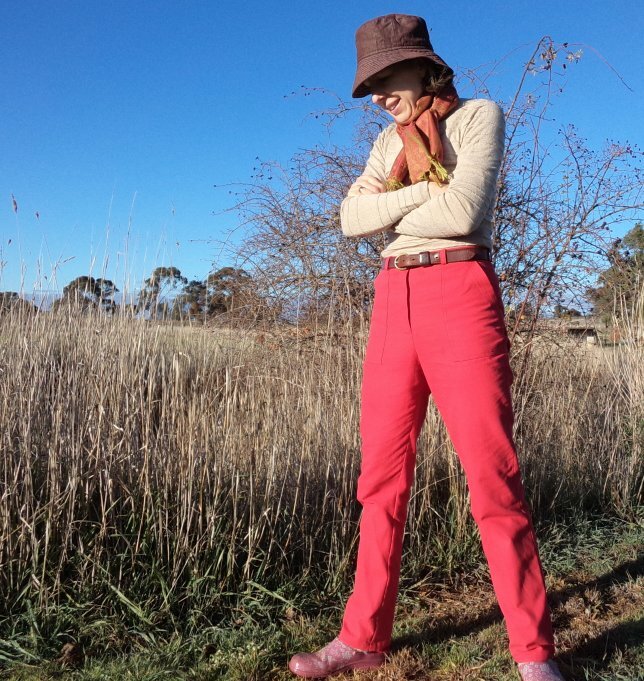 Zero waste jeans: The Quest continues…. I’ve just cut out my first pair of zero waste jeans and the pieces are sitting here waiting to be sewn. Read my first post on this here. The jeans have all the details of regular jeans: 5 pockets, fly front, waistband and back yoke. The aim was to make a zero waste layout so none of the fabric got wasted and 100% got used. 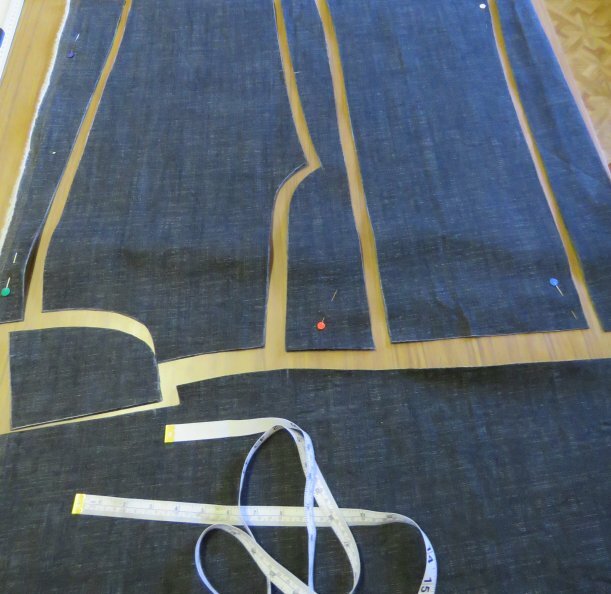 The fabric I used is 144cm wide (slightly stretch) denim from Spotlight. 144cm includes the selvedges which I used too. The pieces with the question marks will be used to make patchwork knee patches, because I actually found that I had more than enough fabric for all the pattern pieces (due to the slim cut of the jeans and the medium-ish size). I necessarily changed a few pieces: the waistband now has a centre back seam and an extended tab at the front. The fly shield is in two parts with a seam. The back pockets may be square or traditionally shaped (I’ll decide later). Most difficult to place were pieces where only one was required, such as the fly facing and coin pocket, since the fabric is folded double. As I’ve admitted, I didn’t find this very easy at all. Was I over-confident? After I had cut some bits I re-thought and wished I’d done it differently. Too late. I learnt a lot from this layout. If I could do it again I would do it better. I found it hard not to be precious about the existing pattern I was using, since I like the cut and everything about it. I feel like I approached the zero waste layout too conservatively. Anyhow, you might be interested in the thought process. 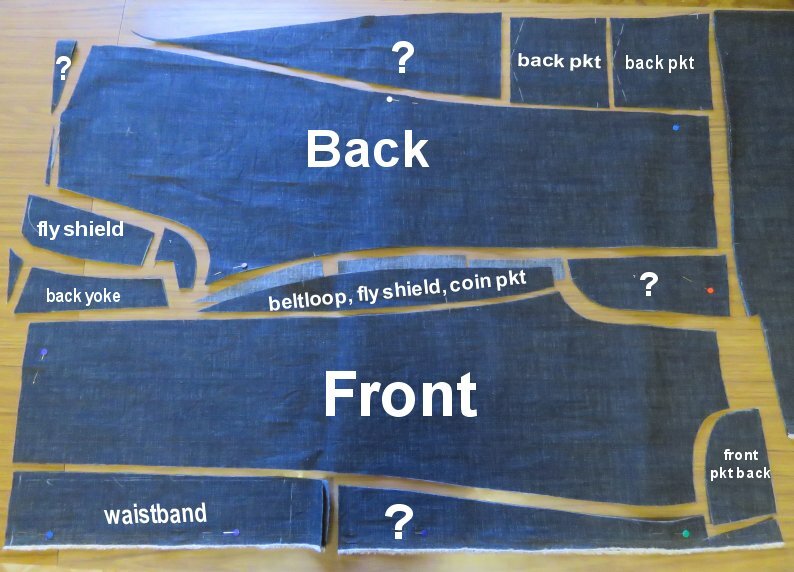 I started with identifying which parts of the jeans pattern are “non-negotiable” (fixed) and which ones can be changed to fit the layout. The pocket bags aren’t included in the zero waste layout since they’re cut in a different fabric. I found a piece of pretty floral cotton in the scrap bag and cut them in that. If I was creating a layout for many pairs of jeans I would try and come up with a zero waste solution for them too. Making a zero waste layout uses the same principles as a regular one: position all the big pieces first, then fill the spaces with the little pieces. In the case of zero waste however, the little pieces and the non-fixed areas need to be tweaked to some degree to fill all the space. This is where the design can become extremely creative (in a good way), leading to interesting and original design details. The question is, how far can one deviate and still end up with what’s accepted as jeans? The large pieces (the front and back) can be arranged in two ways: top-and-tailed (left pic) or facing each other as if they’re looking in the mirror (right pic). Both fitted on my fabric but I chose top-and-tailed. I then agonized over the placement of the little pieces. Is it “cheating” to use scraps as applique? Some people think it is, and others see it as an opportunity for embellishment. Sometimes the applique is functional, providing an extra layer of fabric for strength. I have no problem with applique, functional or not, but I prefer to try and get a layout without it. 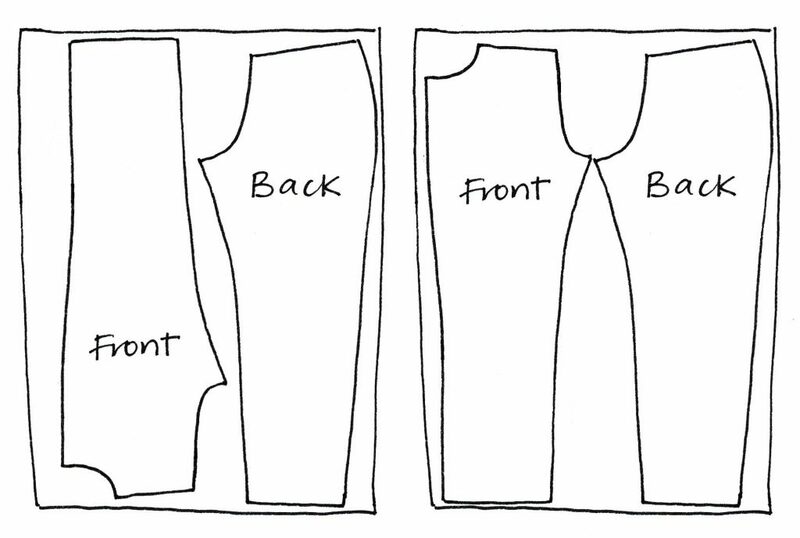 Making a zero waste pattern/layout to match a sketch or, in this case, an expected outcome, is difficult. 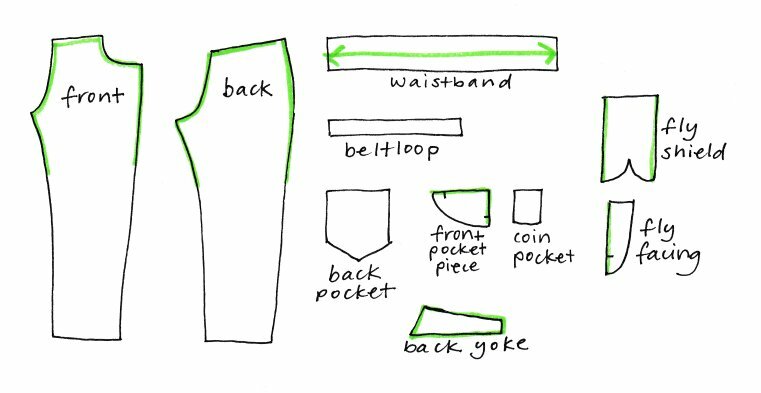 Zero waste design happens as the pattern and layout develop; it’s by doing and seeing what emerges that brings the design direction, rather than a designer doing a sketch and handing it to the patternmaker to make a pattern for it, which is how clothing is currently designed. Zero waste design works best with no expectations for the outcome, with the fabric and Serendipity allowed to lead the way. It is also really hard to cater for a size range when making zero waste layouts in this way. 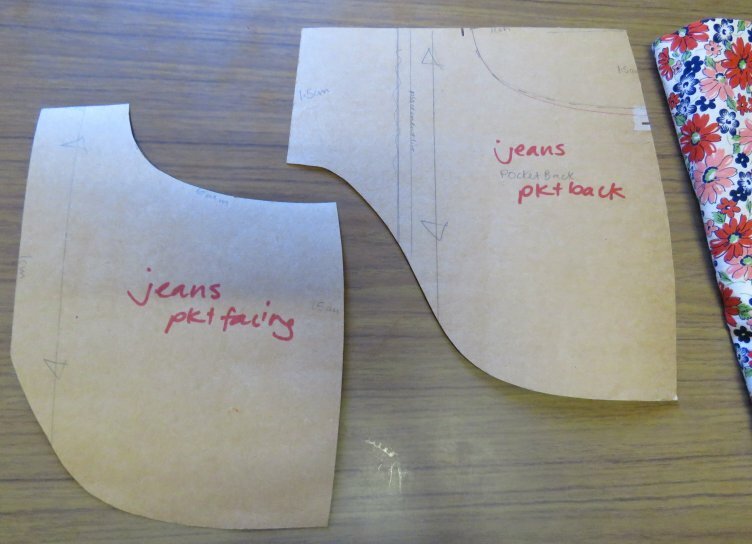 To make each size you need to go back to the drawing board: the jeans pattern would have to be graded in the usual way, then the whole layout started afresh. The non-fixed areas would be different for each size, or the actual style might change slightly across the sizes. It’s clear from this exercise that mass-produced zero waste jeans aren’t going to be a reality anytime soon. 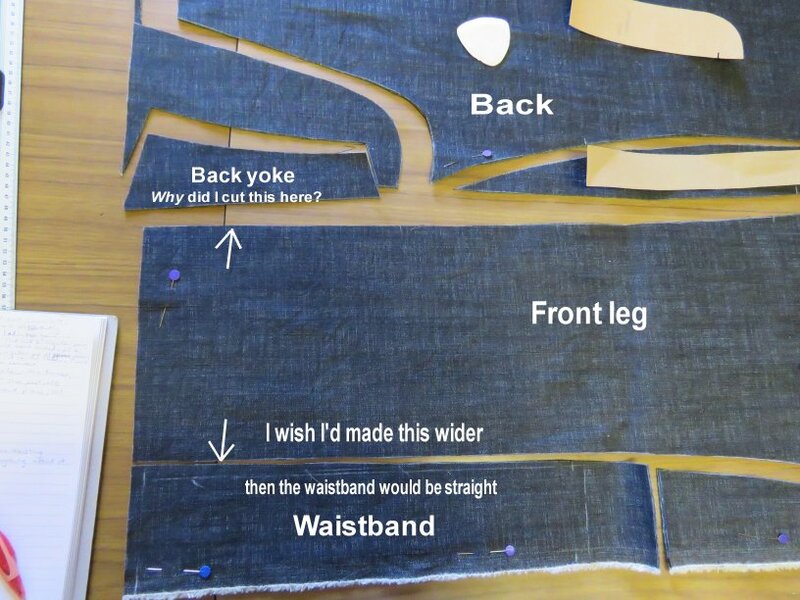 Each size would have different shaped bits, totally unsuitable for a jeans production line. I’ve never worked in a jeans factory, but when I was a fashion student we toured the Levis factory at Elizabeth, circa 1990 (it’s closed now). The factory had two production lines, each producing 5,000 pairs a day. We watched women use specialist machines, such as an inside leg seam flat feller and a waistband-putting-on machine (the poor lady got flustered having a bunch of students watching her and stuffed up a couple of waistbands). I also remember a hi-tech machine that put the stitching on back pockets and pressed under the edges, although there was a machinist doing the same job. These processes need the pieces cut a certain way to suit the machines. However, zero waste jeans would be possible for smaller fashion businesses, preferably where the making is done in-house with highly skilled machinists. So…..I’ll start sewing my zero waste jeans. Check back next week! What a great idea zero waste layouts are. I worked in the industry laying out patterns by computer & a plotter. We would lay out a small size and a large size together. Like a 20 with a 6. You should have a go at this Mary, I think you would be good at it. 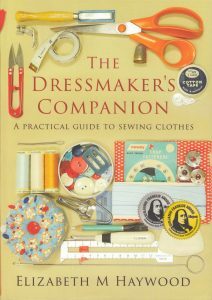 The books Shaping Sustainable Fashion and particularly Zero Waste Fashion got me started. I, too, did industry markers for some years, but manually. As you know, it’s all about recognizing shapes.